Most visitors to Islay will have heard of the Museum of Islay Life in Port Charlotte, and have it high on their list of things to do while on the island. Equally worthy of a visit is a rather less well known attraction a little closer to the centre of the village. The Natural History Visitor Centre occupies the ground floor of some of the buildings which once formed Port Charlotte Distillery and it stands with its back to the sea on your left as you drive into Port Charlotte. The first floor of the same buildings provides a home for Port Charlotte Youth Hostel. The entrance to the visitor centre is down a path which is rather nicely decorated with animal tracks, and these lead to the entrance in the side of the building. It has to be said that only after you have entered the centre, and spent a little time exploring it, does its true size and scope become clear. It seems to occupy most of a very large building, and as a result offers visitors very much more than seems likely, or even possible, from the outside. This isn't immediately obvious as you enter the reception area and shop, nor in the exhibition areas which extend beyond it. But as you delve further, it begins to become clear just how much is on offer here, and just what a wide range of interests and audiences are catered for. The Natural History Visitor Centre was established and is operated by the Islay Natural History Trust and it was opened by Magnus Magnusson on 19 October 1992. 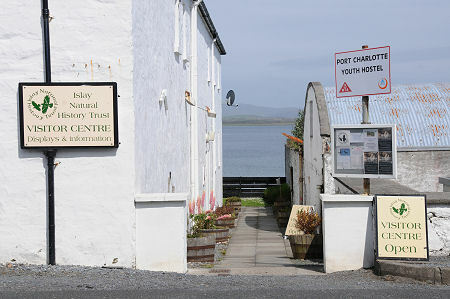 The Trust was formed in 1984 and its aims are to encourage the study and enjoyment of the natural history of Islay and to provide information to residents and visitors. As well as operating the visitor centre it also runs regular "nature rambles" in different parts of Islay during the summer half of the year. The visitor centre comprises a number of separate areas. 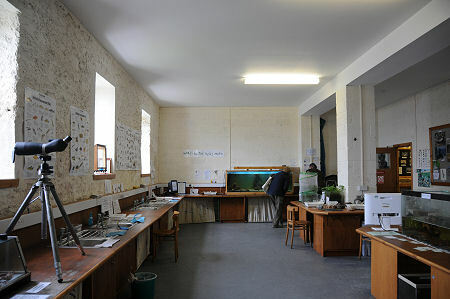 The exhibition areas cover many aspects of the natural history of Islay, from birdlife and geology to the marine environment surrounding the island. What works very well is the way pictures and information are combined with with artefacts and exhibits. 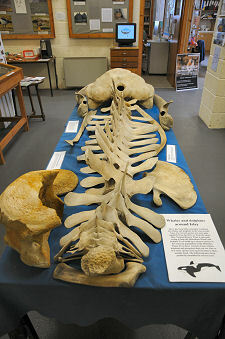 Most visitors will find themselves drawn to the skeleton of a minke whale, one of the smaller species of whale, on display here. Amongst the exhibitions is a fine collection of local pebbles. Off to one side of the exhibition area is a room aimed at younger visitors, complete with art and craft activities, and a range of puzzles, games and quizzes. Also in a room off the main exhibition area is a reference library. Here you can find guides to all the major groups of animals and plants likely to be found on Islay, plus a wide range of other natural history reference books, magazines, journals and reprints. Here, too, you can find information about all the flora and fauna found on Islay since 1984, over the course of tens of thousands of individual observations. This material has been computerised and can be accessed by visitors. The centre also offers a lecture room which can accommodated up to 100 people in theatre layout, complete with audio-visual and projection facilities ideal for supporting small conferences. The final area of the centre is the laboratory. This can house some 25 people in an academic layout. It also offers the largest of the areas routinely open to those visiting the centre, and comes complete with a range of hands on activities for visitors of all ages, plus marine and freshwater aquaria, and a wormery. Here those unafraid of getting their hands wet can explore the rock pool touch tank, and visitors can look at samples under microscopes. Port Charlotte, Islay, PA48 7TX.